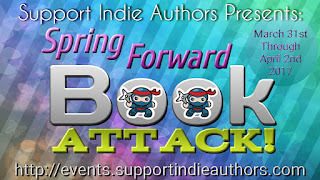 #SIAFBB Spring Forward Book Attack Is Coming soon! Support for Indie Authors is proud to announce our first Free & Bargain Book Event of 2017. For three days, beginning on Friday, March 31st, we will be featuring more than 100 free and 99¢ Kindle ebooks by our independent author members in a wide variety of genres. Want to make sure you don't miss this or future sales events? Sign up for our newsletter and we will send out an email on the morning of the event reminding you to stock up on your spring reading. The tiny ninjas compel you! As always, thank you for supporting our Indie Authors! See you Friday!